There are few things more lazily gratifying in the morning than being served breakfast in bed. You don’t even need to get out of bed, and you’re already being fed – how great is that (especially in the winter, when you dread that first step out of bed onto the chilled floor)? It’s also a great way to surprise someone, but doesn’t require too much work, skill, or money (only a lot of preparation). One note about the orange juice – please please please make an effort to squeeze it yourself! The difference between store-bought and freshly squeezed orange juice is HUGE, and this is one thing you could definitely do on the (late) night before and chill in the fridge. 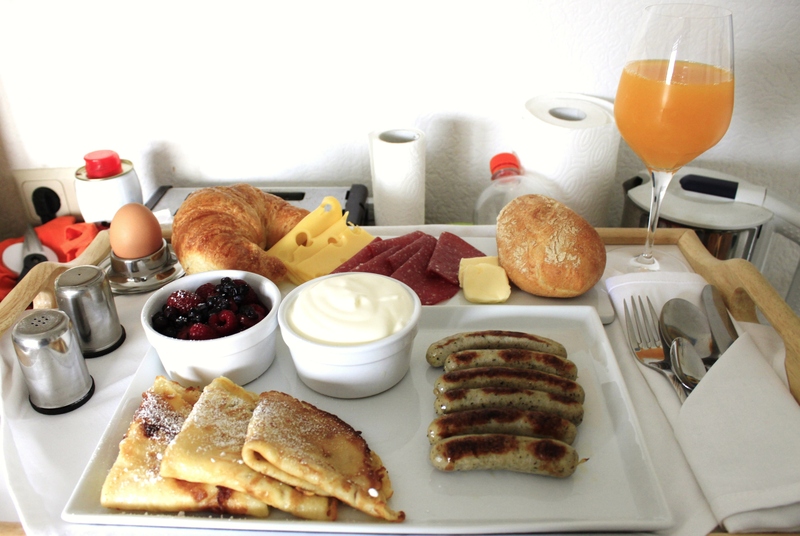 It took me about a half hour to finally prepare everything before service, but I woke up periodically during the early morning to squeeze orange juice and premake the crêpes and Nürnburgers (I reheated them afterward). The cold items are easy enough, as is the bread (I assume you will be buying fresh bread and cold cuts from the deli, not making them yourself), but the hot items are a bit tricky. If you know what time the person is getting up, you just need to get up about a half hour (or however long you think you need) before that to prepare everything. If you don’t know, then…try to guess. You can also cook everything beforehand and leave it in a warm oven until it’s ready to be served (not ideal, but will still work). Of course, this also depends on what you’re cooking. Use your judgement. Buy everything beforehand (the night before, at least) and try to store it where they can’t see it or won’t be suspicious. Prepare what you can ahead of time. Measure out ingredients for pancakes, set aside enough eggs and sausages to simply throw into the pan and cook as quickly as possible in the morning. Use linens and nice cutlery. Add a flower if possible. Small details make a huge difference. Cook with love! Yes, waking up early is not really that pleasant, but I guarantee it will be worth seeing the smile on their face. I wish I can wake up to this in the morning. It is way better than waking up to a stack of journal articles.